Kevin Harvick No.4 Budweiser Chevrolet dominated Sunday’s NASCAR Sprint Cup Series 27th Annual Quicken Loans Race for Heroes, leading 264 of the 312 laps. 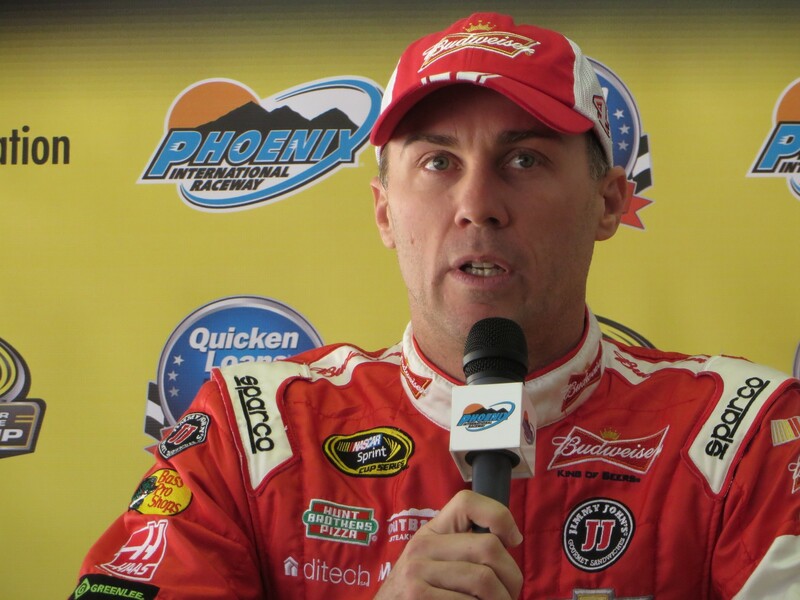 This was his sixth victory at Phoenix International Raceway, and 27th Cup win in 501 starts. Harvick’s Margin of Victory over runner-up, Jeff Gordon No.24 Axalta Chevrolet, was 1.636 seconds. Third through fifth were Matt Kenseth No.20 Dollar General Toyota; Brad Keselowski No.2 Miller Lite Ford; and pole sitter Denny Hamlin No.11 FedEx Ground Toyota – who fought back hard after a long early pit stop for flat tires and body damage. Sixth through tenth were Joey Logano No.22 Shell Pennzoil Ford; Kurt Busch No.41 Haas Automation Chevrolet; Dale Earnhardt Jr No.88 Kelley Blue Book Chevrolet; Greg Biffle No.16 Sherwin Williams Ford, who gained the most positions coming from twenty-sixth to finish ninth; and Aussie Marcos Ambrose No.9 Stanley Ford, who is running his next to last Cup race before returning to his homeland to rejoin the V8 Supercars. The only Chase contender not to finish in the top ten was Ryan Newman No.31 CAT Mining Chevrolet. His last lap move into eleventh position garnered him a Chase slot for next weekend’s shootout. Newman bumped Rookie Kyle Larson No.42 Target Chevrolet to gain the position and the valued point. Larson ran as high as second at one point, before finishing thirteenth – the top Rookie. The race was notable for more than Harvick’s victory. A three-minute Red Flag was displayed, to clean up debris after three cars came together – two who retired – Clint Bowyer No.15 5-Hour Energy Toyota and Rookie Cole Whit No.26 16T fuelxx/TapoutMuscle Recovery Toyota; and Kyle Busch No.18 Benfield Pet Hospital Toyota, who continued but finished four laps down. Five of the record-high 12 cautions were for debris, not including the Red Flag. A total of 58 laps were run under the Yellow Flag. Harvick took the lead for the first time on Lap 44. Before that pole sitter Hamlin led for 24 laps, followed by Logano for seven, David Ragan No.34 Taco Bell Ford for two laps during pit stops and Logano again for eight laps. Harvick led three times. Earnhardt led four laps and Rookie Michael Annett No.7 Accell Construction Chevrolet led a lap during pit stops. Annett finished twenty-sixth after starting thirtieth. The four drivers remaining in The Chase are: Hamlin-4112 points and one win; Logano-4111 points and five wins; Newman with 4103 points and no wins; and Harvick with 4102 points and four wins. Newman has a one in four chances to become the first Champion with no victories. Despite several accidents, no drivers were injured – just their pride and their cars. Kenseth turned the race’s fastest race lap. Twenty-five drivers finished on the lead lap, and thirty-eight drivers finished the race in some form or another. All cars cleared Tech, and the two cars sent to the NASCAR R&D Center in North Carolina belonged to Harvick and Gordon. The Chase will crown a victor next Sunday at Homestead-Miami Speedway.